With Christmas fast approaching one of my favorite traditions is getting ready to be under way at the Black Forest Inn – the 12 Days of Christmas (Cookies)! If you haven’t tried their oh so traditional German cookies, we recommend you get out there each day to get your sweet fix. You can’t beat their Christmas cookies and added bonus, they do all the cooking. Just show up, they do all the rest. Black Forest Inn doesn’t just have you covered on cookies though. Try out their holiday menu (don’t be surprised if you need someone to roll you home after all that great German food). Another Holiday tradition you can’t go with out is their Christmas Market – beautiful handcrafted gifts from local artists (along with maybe a few great gifts for yourself?). We hope to see you there this Christmas! Christmas Market – Check out our model Christmas Market outside in the beer garden, then come inside our banquet space for a real Christmas market! Local artists, hand-made crafts and products including fiber arts, jewelry, jams & jellies, soaps and lotions, cookies & bread, books, candles and more! You’re sure to find an affordable treasure for the perfect gift! The Market will be open from 12:00 – 6:00 p.m. Saturday and Sunday, December 12 & 13. • Springerle demonstrations at 3:00 p.m. each day! 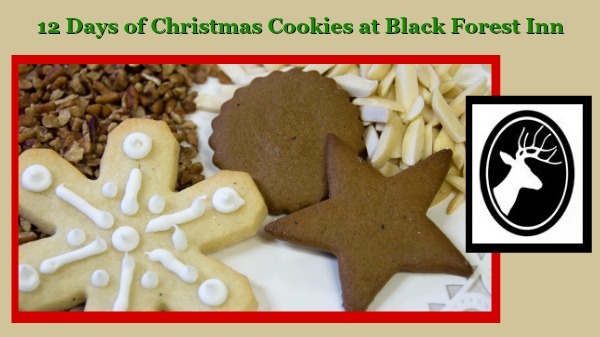 • Of course, the Black Forest Inn will be selling stuff too – t-shirts, mugs, gift certificates, coffee beans, mustard, cookies, marzipan and anything else you can think of to give as a gift! Spirit of Giving Fridays in December are days of giving at the Black Forest Inn. Join us for each Friday as we, with your help, make charitable donations to a few causes and organizations that we like. We will be donating 20% of our food sales on those days so the more you eat, the more money they get. Holiday Menu Cover Contest (click here for guidelines) (click here for previous winners)! Join us on December 22 as we celebrate the darkest day of the year with a special on all our dark beers! That should cheer you up! Day One – Ginger Thins, a crispy, spicy cookie to have with coffee or a cold glass of milk! Day Two – Russian Tea Cakes, these nutty, buttery, sweet cookies are a must for the holidays! Join us this Friday as we, with your help, make a contribution to the Whittier International Elementary School’s Skis in School program. We’re raising funds to help them buy 40 pairs of youth skis. Over 30 different languages are spoken in the homes of students at Whittier School and the majority of the kids live in the Whittier Neighborhood. A fun, cross-country skiing adventure is an experience many of them would not otherwise have and will hopefully remember fondly for a long time. We will be donating 20% of our food sales tonight so the more you eat, the more money they get. Try a sample! Buy a whole roll at a special price! Day Ten – Sugar Cookies, soft, sweet, charmingly decorated… what’s not to love? Join us this Friday as we, with your help, make a charitable donation to the Whittier Alliance, the neighborhood organization of the Whittier Neighborhood. We are making this donation in honor of the retirement of longtime Executive Director Marian Biehn. The Whittier Alliance, under Marian’s leadership, has hosted hundreds of community meetings on every topic from safety to recycling to re-opening Nicollet Avenue. The organization has helped preserve historic structures in the neighborhood, it holds voter registration drives and neighborhood clean-ups. We will be donating 20% of our food sales on those days so the more you eat, the more money they get. Day Twelve – Springerle, these are beautiful, pale, anise flavored cookies, embossed with lovely images. The grand finale! All day (12 – 6pm) in our banquet space come shop the variety of local artisans, craftspeople and collectors. Browse jewelry, textiles, paper, soaps and lotions, books, artwork, and, of course, Black Forest Christmas cookies and other treats. It’s bursting at the seams with affordable treasures to give as gifts or to keep for yourself! All day (12 – 6pm) in our banquet space! Join us this Friday as we, with your help, make a charitable donation to Calvary Church for their project to start a Whittier Farmer’s Market on 26th and Blaisdell starting in 2016. They are working with the city and neighborhood volunteers to have all the necessary permits in place and have participating farmers and food producers ready to offer fresh food to the residents of the Whittier neighborhood. We will be donating 20% of our food sales on those days so the more you eat, the more money they get.